How crazy would it be if we drank our champagne… frozen?! I say, as long as it involves champagne, I’ll drink it any way, shape or form. This is the first of two cocktails that I think are so super perfect for your Easter weekend. And it couldn’t be easier! I’m actually embarrassed (again) at how easy this is. It just requires a leeeeettle bit of prep on your part, in the form of making orange juice ice cubes. 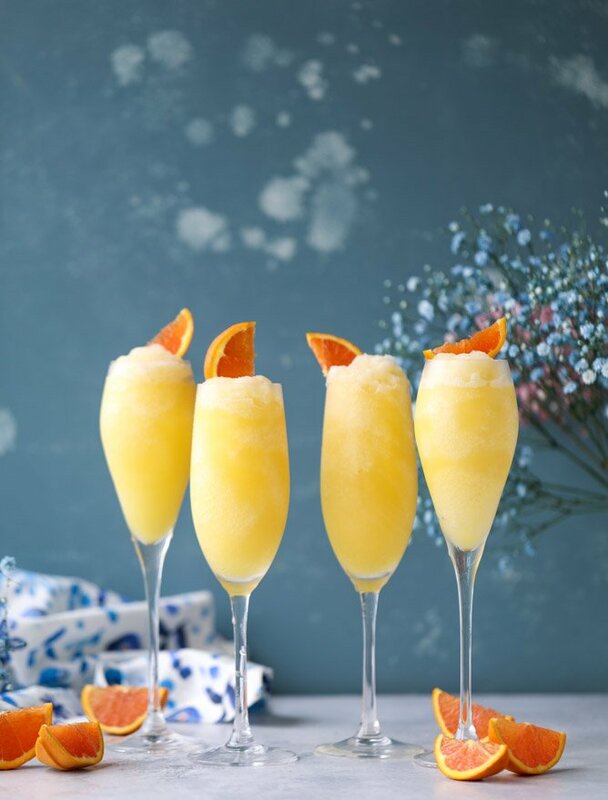 I have some delicious fruity ice cubes coming in my next book, which is where the idea for a frozen mimosa even came from. I initially thought I could do orange juice cubes with champagne poured over top, BUT. What about blending them together? It’s like a frosty dessert that you get to have BEFORE your meal. Let’s be real: you could have them at any point in time over the year, but it’s so cold during winter holidays that the last thing I want is an icy drink that’s reminiscent of snow. So save it for the sunny days like these when all the spring blooms are popping up and we are thisclose to having a taste of warmth. It’s just in our glass! Looks like sunshine for sure. And has sooo much vitamin C that it may as well be a supplement. 100% going to make frozen GRAPEFRUIT mimosas for our actual Easter cocktail. That’s my favorite mimosa flavor and it will also be super pretty in pink. The flavor options are just ENDLESS. And frozen bellinis too! Oooooh I like where this is going. ALSO. These remind me of my frosty coconut mojitos which I love so.freaking.much. Craving one of those like whoa at the moment because they taste like summertime. Hurry hurry! orange slices/wedges for garnish I like cara caras! The night before, fill two ice cube trays with orange juice and freeze them overnight. The next morning, add your orange juice ice cubes and your champagne/wine to a blender and blend until frosting. If the mixture is too liquidy, you can add a few extra (regular) ice cubes! Coconut Custard Pie with Coconut Whipped Cream. They’re so pretty! I volunteer to test every kind of citrus. Lovely! the grapefruit version sounds delicious too. Does the champagne lose much of the fizz after blending? I’ve never tried blending champagne, but I just love all the bubbles! This looks so refreshing and I love how simple the recipe is! This looks so good and frosty, trying it out for sure!! These totally remind me of orange julius drinks…but grown up style. Totally up my alley!! Mimosa slushies?? This is like the next best thing to the alcoholic juice pouches that you put in the freezer ;) Will definitely be trying this, thanks for sharing! WHY haven’t I done this before?! This is brilliant and I can’t wait to do this at my next brunch. Uhh oh, I have something similar scheduled soon lol :/ Frozen drinks are going to kill it this summer! You have me totally hooked on this! I can’t wait to make them for Easter — and we are having lamb so I think the pink grapefruit would be great. I’m pinning, pinning, pinning!!! You won’t believe this but I’ve been wishing everyone a Buona Pasqua thinking that Easter was this Sunday!! It took my youngest son to tell me that it was a week from this Sunday. DUH!!!! This looks stupid easy and I LOVE it. Bring on the sunshine and bring on the frozen drinks! I am so beyond ready for warmer weather. Cannot wait to be enjoying one (or 3) of these by the pool! Jessica – if you were scaling this recipe to make one drink, about how many ice cubes and how much Prosecco do you think would work? Thanks! So, I think we can safely call these, “Fro-Mo’s”…. now I’m having FOMO of Fro-Mo’s. I love sweets ad desserts. Can you please share the chocolate ice-cream recipe with lots of chocolate chips? My most loved one is the chicken with seeds out of the jack natural product in (yummy) The more seasoned age like curries produced using dried fish which is very solid and rancid, and individuals appear to like acrid and unpleasant tastes instead of sweet stuff.